This is a discussion group mooSocial's Android Social App. 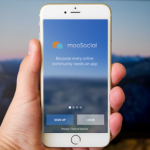 It is a "white labeled" mobile app for mooSocial script with many features to support a rich user experience and helps increase members engagements. 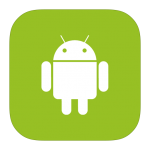 Android Social App is a necessary component for Mobile Solution for online communities. GeorgiosT We want our website to be friendly to the world, not to make life difficult, Why, they are sure to leave us. Mark Working on apps to make it compatible now. Please wait. We stated very clearly in the release note that the apps are not compatible yet. I&apos;m wondering if anyone can help me, because I&apos;ve contacted support and I believe the language barrier is holding things up. We had purchased the Android + iOS apps for our mooSocial site, and they were published *by mooSocial*. In the past couple of months, our Android app has expired in the Google Play store, and now support is telling me I have to publish the apps myself under my own Google Play developer account. This is not what I want to do. I just want mooSocial to republish our app t... moreI&apos;m wondering if anyone can help me, because I&apos;ve contacted support and I believe the language barrier is holding things up. We had purchased the Android + iOS apps for our mooSocial site, and they were published *by mooSocial*. In the past couple of months, our Android app has expired in the Google Play store, and now support is telling me I have to publish the apps myself under my own Google Play developer account. This is not what I want to do. I just want mooSocial to republish our app through their account. I even purchased the republish service from mooSocial and they are still telling me I need my own developer account. Please help! We can support you publish your android app into under company account, but IOS app you should buy a developer account and publish your app via your apple developer account. What do you think? It&apos;s more better to publish your apps under your own accounts/brand name. Kevin Roth This will be costly and cumbersome for me if I need to publish the apps under my own developer accounts. It will also mean that my entire community will need to delete and re-download the new apps from the app store. This is not a good solution for me. I was sold a package where the apps were to be maintained and published through mooSocial, and I would expect that to continue. On the mobile apps purchase page, your website says "Publish on App Store using mooSocial’s account if requested" (... moreThis will be costly and cumbersome for me if I need to publish the apps under my own developer accounts. It will also mean that my entire community will need to delete and re-download the new apps from the app store. This is not a good solution for me. I was sold a package where the apps were to be maintained and published through mooSocial, and I would expect that to continue. 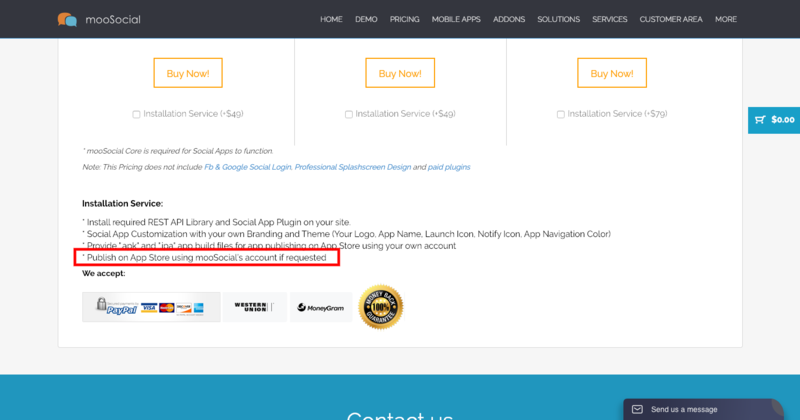 On the mobile apps purchase page, your website says "Publish on App Store using mooSocial’s account if requested" (see attached screenshot). If this is not a service you will continue to provide, you need to remove that from your website and notify your customers that use this option. If mooSocial can no longer publish the apps on our behalf, our organization may cease using the apps altogether, which would be unfortunate. I would also expect a refund for the republish apps service I just purchased as recommended by support. Mark will remove the line of text in the screenshot. It&apos;s a bit risky to publish your app under our account. If your app has a problem, google may ban our account and all apps published under our account will be gone. Kevin Roth I understand your position, but I purchased it with the understanding that mooSocial would be maintaining our apps, not me. Unfortunately we will likely not keep the apps due to this shift in support. Mark If your apps already published under our accounts, we&apos;re happy to continue helping host them. Please continue working with mobile team to update. Kevin Roth Mark, support keeps asking me for admin access to our mooSocial website and FTP access as well. This should not be required to republish to the Google Play app store, correct? I don&apos;t see why any code changes would be necessary on the website. Mark If they asked you, I think it&apos;s required. Please provide to speed up publishing progress. Any plans to integrate a "sharing to mooApp" function? Example: if you want to share a video or picture directly from your favorite image app to the mooSocial app. The mooSocial app should be in the list next to Whatsapp, Facebook, Instagram or whatever. Do the apps come with the live chat feature? Mark No, chat is paid plugin. Jerry Thompson Ok thanks. I will purchase it today. WIll custom changes to my website reflect on the apps? Mark Yes, we will apply changes for both web and apps. Mike Reynolds Yeah, I make my app downloadable directly from my site. Submit a ticket and request they provide you the apps to host from your site. Robert do they work the same from your site do the pushes work? Mike Reynolds When people download the mobile app from Play Store or the iOS store, they&apos;re just downloading the app. So it makes no difference from where they download the app. All the programming happens in communication with the app itself and the api installed on your site. Is that correct Mark? ketkew not in the Apps for Android or iPhone. The menu items are added manually in the apps and the mooTeam should rebuild your app. ketkew This has nothing to do how moo has configured the app. This is how it works for a native app. Native means a custom build of an app which is different as webbased.